Yale's latest smart lock, the Yale Conexis™ L1 in black, is easy to install and doesn't require a professional - all you need is a screwdriver. Fits 95% of uPVC or Composite doors. British Kitemark approved to TS621:2018 standard. Suitable for existing Multipoint "lift-to-lock" mechanism. Keep track of who comes and goes via the app. 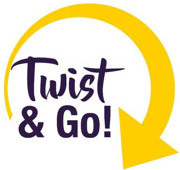 "Twist & Go!" - twist your smartphone 90° to unlock. Lock will accept up to 50 different key cards or tags. Suitable for external doors and weather resistant (IP55). Inside handle includes a child safety thumbturn. Suitable for door thickness 44 - 70mm. Check compatibility. Reversible handle - use on left or right of door. 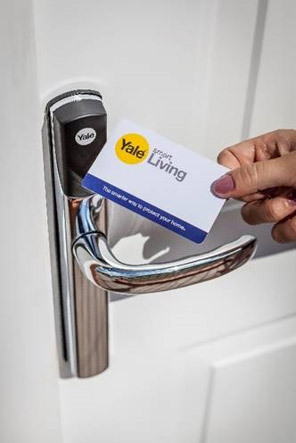 The future of door locks is here with the very latest in security from Yale. 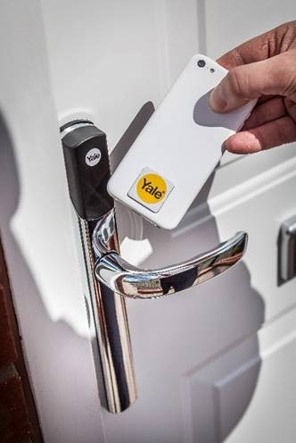 The new innovative design of the Yale Conexis™ L1 - Black puts you fully in control of your home security, providing the ultimate peace of mind. Access your property in a variety of ways to suit your lifestyle and send time sensitive mobile keys to family and friends. The Conexis L1 meets PAS24 door security standard and is powered by batteries with an emergency 9v battery power point in case the batteries run flat. There's no requirement for a professional trade's person to install the lock as a simple DIY install is all that is required; all you need is a screwdriver. The door can be opened from the inside by simply pulling the handle, for quick and easy exit in case of fire or emergency. The lock includes both external and internal handle plates, a fixing kit and 4x AA batteries. The handle is an easy DIY install designed to simply replace your existing door handle. The Key Card is the same size as a credit card and can fit neatly inside your purse or wallet. Simply place the Key Card over the lock reader to open the lock once registered. 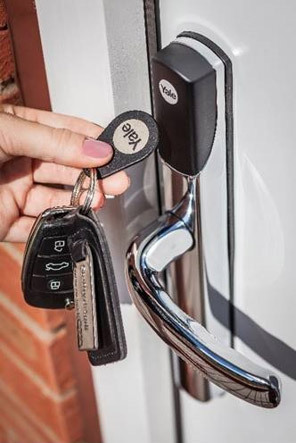 The Key Tag is designed to attach to your key ring and opens the lock with a simple swipe across the lock reader once registered. 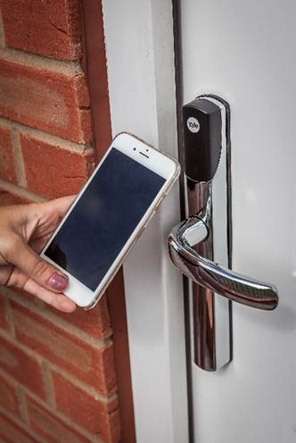 Thanks to the new Twist and Go Functionality, you can twist your phone 90 degrees to unlock your front door using Bluetooth. No need to open the App. Works within a 2m range. The new Yale Conexis™ L1 opens in a variety of different ways to suit your lifestyle. Open the lock without a code by swiping a registered key card over the lock reader. Carry a key tag with your keys and swipe over the lock reader to open. Twist your phone 90 degrees to unlock the lock via a Bluetooth connection. Place a phone tag to the back of your mobile phone to ensure you have it at all times. 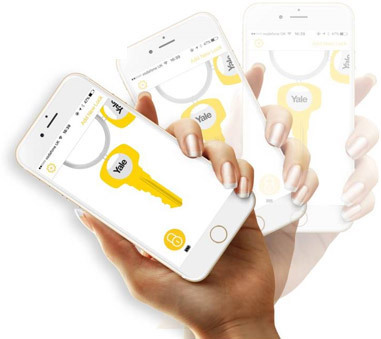 Yale's Smart Lock App allows you to open the door by twisting your phone 90 degrees in front of the lock reader and allows you to send mobile keys to friends and family remotely for as long as you choose. The App also provides an audit so that you can keep track of who comes and goes. In addition to the app, the lock can also be open by key card, key tag or phone tag. One key tag and one key card are supplied with the lock as standard. Phone tags can also be purchased separately and you can register up to 50 smart tags in total. The Conexis L1 fits 95% of uPVC or Composite doors so you can upgrade almost any residential door fitted with an existing 92mm centred multi-point "lift-to-lock" mechanism to a Conexis L1 Lock. The Yale Conexis L1 is easy to install on a DIY basis and does not require a professional tradesman. The lock simply replaces your existing handles and the only tool you will need is a screwdriver. See our Yale Conexis L1 Installation Guide. Control the Conexis L1 using the Yale Home System App when you purchase the optional Yale Smart Lock Module. This module allows the lock to connect to Yale Smart Home Alarms or CCTV with a USB adaptor.